Appendix available in the PDF and Scribd versions of this issue brief. In 2002, the Powder River Basin, or PRB, in Wyoming and Montana surged past the Appalachian coalfields that stretch from Pennsylvania to Tennessee to become the nation’s largest coal-producing region. 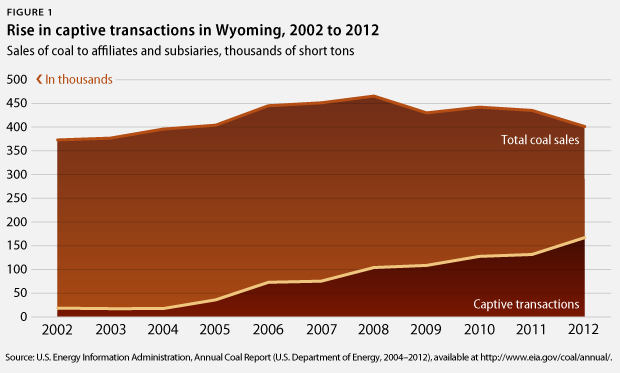 Today, the PRB occupies a 40 percent share of the U.S. coal market. Although market forces, mechanization, and technological changes help explain some of the coal industry’s decision to shift more production from privately owned lands in the East to federal lands in the American West, the U.S. Department of the Interior’s, or DOI’s, coal policies have played an equally important—though largely unnoticed—role in this transition. Specifically, the DOI’s Bureau of Land Management, or BLM, and Office of Natural Resources Revenue, or ONRR, use their royalty-collection authority to subsidize coal production on federal lands. Coal companies, in turn, have learned to maximize these subsidies by shielding themselves from royalty payments through increasingly complex financial and legal mechanisms. Reform is urgently needed to cut these subsidies and to close loopholes that disadvantage other coal producing regions and distort U.S. energy markets. The law governing royalty payments for coal produced on federally owned lands is straightforward. Under the Mineral Leasing Act of 1920 and its amendments, coal companies are required to pay a royalty of at least 12.5 percent of the value of surface-mined coal and 8 percent for coal from underground mines. The law authorizes the secretary of the interior to set the regulations by which the value of federal coal is determined for calculating a royalty. In a competitive marketplace, a product’s value on the market is the price that maximizes profit for the seller based on what a buyer is willing to pay. In the case of thermal coal—or coal that is burned to produce electricity—power plants and electric utilities are the buyers in the market. The market value of thermal coal, therefore, is the price that power plants are willing to pay for the product. In theory, royalties should be paid on this market price of coal. The assessment of royalties on the so-called “first arm’s-length sale”price of coal instead of the true market value. Coal companies pay royalties on the price that they receive at the first sale to another entity. This transaction can be to an affiliated or nonaffiliated entity but must be valued as an arm’s-length transaction irrespective of the buyer’s relationship to the coal company. This sale often occurs near the point of production, meaning that taxpayers typically receive royalties on the mine-mouth price of coal instead of the true market price at which the coal is sold to a power plant or other end user, such as a broker who exports the coal. As a result, the federal government assesses royalties too early in the sale process and on prices that are not reflective of the true value of coal, which in turn results in lower royalty returns to taxpayers. Royalty reductions for noneconomically viable coal production or financial hardship. The BLM provides royalty reductions as low as 2 percent of the sale price if a mine becomes unprofitable due to unfavorable conditions—such as limited access to coal or a decrease in its quality—or if a mining company can show it is facing financial hardship. Subsidies for the costs of washing and transporting coal produced on federal land. Under the current system, coal lessees can deduct transportation and washing costs, with no cap on deductions, from the total sale price upon which federal coal royalties are due. This translates into an allowance for the full cost of transporting federal coal from the mine mouth to a remote point of sale or to transport the coal to a distant wash plant. Unlike coal, transportation deductions for oil and gas are capped at 50 percent of the value of the resource. A review of government data and the records of the largest coal companies operating in the PRB—such as Alpha Natural Resources, Ambre Energy, Arch Coal, Cloud Peak Energy, and Peabody Energy—reveals that, notwithstanding industry claims that the markets have remained stagnant, the coal market in the PRB has changed dramatically in the past decade alone. Of perhaps greatest note, the major coal companies operating in the PRB have built an extensive network of subsidiaries and affiliates through which they sell and distribute their coal, which appears to help maximize their subsidies. A review of corporate documents from five of the biggest coal companies operating in the PRB, listed below, reveals hundreds of affiliates and subsidiaries of parent companies with names such as Excelven Pty Ltd., licensed in the British Virgin Islands, and Jacobs Ranch Holdings LLC, licensed in Delaware. Alpha Natural Resources, operator of the Belle Ayr and Eagle Butte mines in Wyoming, has built a network of 184 domestic and foreign subsidiaries. Ambre Energy, which operates the Decker Minein Montana that has produced more than 300 million tons of coal, has built a network of 26 domestic and foreign subsidiaries. Arch Coal—which controls more than 3.3 billion tons of coal reserves in the PRB and operates the Black Thunder Mine, one of the globe’s largest coal mines and the first in the world to ship 1 billion tons of coal—has built a network of 83 domestic and foreign subsidiaries. Cloud Peak Energy, which operates the Antelope, Spring Creek, and Cordero Rojo mines in the PRB that produced more than 86 million tons of coal in 2013 alone, has built a network of at least 31 domestic subsidiaries. 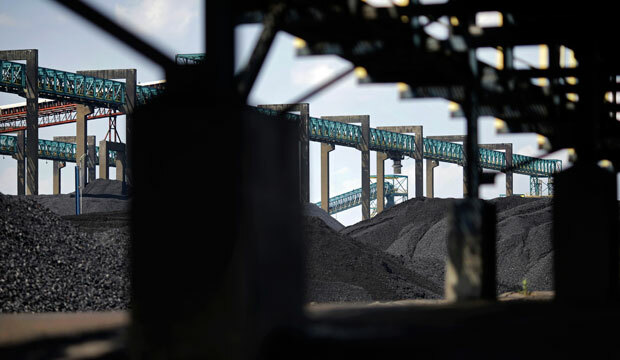 Peabody Energy—which operates the North Antelope Rochelle Mine in Wyoming, the largest coal mine in the United States—has built a network of 141 domestic subsidiaries and 101 foreign subsidiaries. A full list of the affiliates and subsidiaries of these companies is provided in the appendix. Sales of PRB coal through this network have skyrocketed in the past decade. According to data from the U.S. Energy Information Administration, or EIA, 42 percent of all coal produced in Wyoming in 2012 was sold through a “captive transaction”—a sale between an affiliate and parent company—up from just 4 percent in 2004. This upward trend appears to have begun in 2004; captive transactions in Wyoming spiked 105 percent between 2004 and 2005 alone. A growing body of evidence suggests that the major coal companies use their elaborate network of subsidiaries and affiliates to maximize the subsidies that can be gained through existing federal royalty regulations. To keep the price of coal artificially low for royalty, tax, and other valuation purposes, companies are allegedly cloaking sales to their network of subsidiaries and affiliates as arm’s-length transactions when they are in fact captive, non-arm’s-length transactions. Similarly, in Cloud Peak Energy v. Montana Department of Revenue—a Montana state court case regarding a tax dispute—the state of Montana alleged that Cloud Peak Energy intentionally undervalued federal coal sold to two affiliates between 2005 and 2007 to pay reduced taxes. The arm’s-length-transaction loophole is particularly lucrative for coal companies that are exporting PRB coal to foreign buyers. * A 2012 Reuters investigation estimated that the loophole allowed companies to pocket at least an additional $40 million on coal exports from Wyoming and Montana alone in 2011. The state of Wyoming—which, similar to other coal producing states, receives approximately 50 percent of the royalty revenue from coal production on federal lands within its boundaries—has formally asked the Obama administration to change current regulations to better prevent coal companies from using their networks of subsidiaries to dodge royalties. “Non-arm’s-length transactions are highly susceptible to manipulation,” wrote Michael Geesey, director of the Wyoming Department of Audit, to ONRR in 2011. According to Geesey, Wyoming’s chief auditor, ONRR should change current regulation to prevent coal company sales to “affiliates, partners, marketing agents, and trade and export associations” from qualifying as arm’s-length transactions. Republican and Democratic members of Congress and independent reviewers have also called for reforms to close this loophole. Today, however, the DOI’s federal coal program can hardly be held up as a model of American leadership in transparency or efficiency. U.S. taxpayers and the states that share in these royalty collections are receiving far less than the 12.5 percent royalty rate that is required to be collected from surface-mined coal. Additionally, the United States’ biggest coal competitors in Pacific markets, such as Indonesia and Australia, do not allow many of the subsidies currently in place under the U.S. system. In Indonesia, for example, the royalty rate for exported coal is based on the true market value of the coal received at the export terminal, which is a price determined from the benchmark price or actual sales price, whichever is higher. Further, Indonesia does not allow transportation costs to be deducted from the price of coal upon which a royalty is levied. Likewise, states in Australia do not allow transportation deductions for domestic shipments of coal. The DOI has acknowledged some of the deficiencies of the current royalty-collection system, recently issuing a proposed rule to remedy the arm’s-length-transaction loophole. While this proposed rule closes one regulatory gap by eliminating the arm’s-length-transaction loophole, more significant reforms are needed to improve efficiency and transparency in the federal royalty-collection process. The Obama administration should take a major step toward eliminating the DOI’s subsidies for coal by modernizing existing regulations to apply the federal royalty on the commodity’s true market price—which is at the final point of sale to an end user, such as a utility or power plant, for both domestic and export sales. This straightforward reform would alleviate burdensome royalty assessments for ONRR while also ensuring that taxpayers are receiving a royalty on the true market value of coal. Currently, the EIA provides publicly available information with the final sales price for federal coal; ONRR auditors could use this information to calculate and verify royalty obligations, eliminating the need for complicated and time-consuming closed-door valuation estimates by federal regulators. Making such a change would not come without opposition from coal companies, which have built a complex system of corporate entities to game the current system and shortchange taxpayers. Nevertheless, the administration must enact reforms. Each month, U.S. taxpayers and state governments are missing out on tens of millions of dollars in revenue that would accrue if the DOI was enforcing the minimum 12.5 percent royalty rate that is required by statute rather than effectively lowering rates through subsidies and regulatory loopholes. Taxpayers are not the only ones hurt by an outdated coal royalty system. Federal subsidies in the PRB unfairly disadvantage coal producers in Appalachia and other regions, contributing to job losses and economic dislocation in Appalachia. More broadly, the DOI’s subsidies for coal distort U.S. energy markets, incentivize U.S. coal exports by subsidizing transportation costs, disadvantage cleaner sources of energy, and ultimately undercut the president’s Climate Action Plan. The DOI should level the playing field between coal operators and ensure that taxpayers are receiving a fair return on their publicly owned resources by expanding its proposed rule to apply the federal royalty rate to the true market value of coal at its final point of sale. Matt Lee-Ashley is Director of the Public Lands Project and a Senior Fellow at the Center for American Progress. Nidhi Thakar is the Deputy Director of the Public Lands Project at the Center. The authors would like to thank Lauren Vicary, Mina Grace, Chester Hawkins, Anne Paisley, and Meredith Lukow for their art and editorial assistance on this brief. *Correction, February 9, 2015: This issue brief has been corrected to remove a reference to Peabody Energy’s revenues and royalty payments.